The Rome Project – on view in the ReadingRoom February 17 – April 7. It is a pleasure to be featuring the work of Alice Austin in The Reading Room this spring. Alice is one of the artists who sent work out for the first show at Abecedarian, and her ongoing support of this project has been steady and is appreciated. For this exhibition, Alice came for the installation and opening night. During the reception she captivated visitors with details her most recent body of work. Alice Austin has been traveling to Italy each fall for the past several years. Although she has spent time in Venice, her favorite Italian city is Rome, where she has been a visiting artist at the American Academy. She takes with her only what will fit into her bright red suitcase; once there strolling through the city examining historical documents, public buildings and attractions. As a library conservator (Alice works at The Library Company of Philadelphia, a rare book library founded in 1731 by Benjamin Franklin), her appreciation for historical records is well embedded, her comfort with historical documents a fact of her life. By all accounts, Rome is rich with history, and because Alice visits as an artist with a particular project in mind her visits take on quite a different aspect than were she traveling as another sort of visitor. Indeed, the night of her reception for The Rome Project at Abecedarian, a gallery visitor was telling me that her experience of Rome is that it is corrupt, noisy, expensive and difficult to navigate. This is hardly the Rome that Alice presents in her most recent body of work The Rome Project. This project began in September 2008 when Austin was a visiting artist at the American Academy in Rome. Her project was to study the 1748 Giambattista Nolli map of Rome and synthesize the character of the historic map with modern Rome. 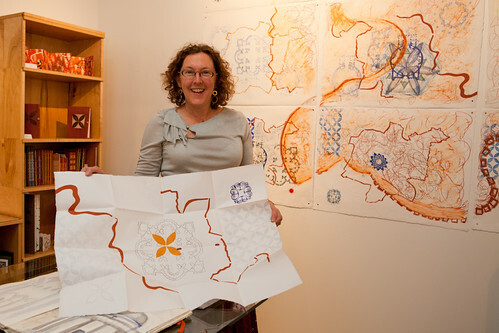 She set out into the city to record the patterns, geometry and textures of the Nolli map sites through photos, drawings and paintings made at prominent sites from the map. The first result of her work was a limited edition bookwork, Nolli, a map-book exploring the textural layers of Rome produced collaboratively with designer/photographer Jon Snyder. This modestly scaled book, presented in a what is sometimes called a meander book format, presents details that are later referenced in the large scale drawing suite and series of artists’ books. The front and the back covers show elements from the originally Nolli map, which was executed in 1748 as twelve copper plate engravings, each about 22 x 30 inches. Nolli had papal permission to enter all buildings in Rome in order to make accurate measurements, a project which took him over ten years. The back page of the book is a photograph of a litho plate of the Forma Urbis, the Roman map which was executed in stone. The red line that continues throughout the book depicts the shape of the city wall, taken from the handmade paper, and is shown on the reverse side of the map in white. The book also includes a detail photograph of the Nolli map, a watercolor of Bramante’s Tempietto, on which the design for St. Peter’s is based, photographs and prints of the Campidoglio pavement designed by Michelangelo, and a rendering of the first century pyramid of Caius Cestius, built when the Romans were interested in all things Egyptian. The back side of the map unfolds to reveal a drawing of historic Rome and Bramante’s architectural plan for St. Peter’s. 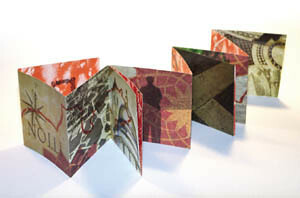 Nolli was offset printed in an edition of 60, in collaboration with the Borowsky Center at the University of the Arts, Philadelphia, 2010. Copies are available at this link ($150 each). On stunning display in the Reading Room is the installation of Austin’s suite of 9 drawings of Rome, each 22 x 30 inches, arranged in the same manner as Nolli’s Pianta Grande di Roma to make one large drawing measuring 66 x 90 inches. 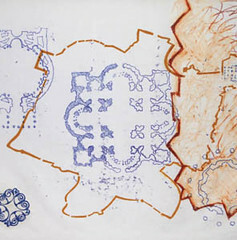 Limited in palette, the mixed media drawings include ink, crayon, relief printing and transfer drawings on sheets of linen paper hand made at the Dieu Donne Paper Mill in New York City in 2009 especially for this project. During Alice’s informal gallery talks at the opening I learned that the name Dieu Donne means god given, which, given the scope and references of this project, seems appropriate. The paper incorporates a stencil pulp painting of the Aurelian city wall colored with dry pigments from Rome. Linoleum prints inspired by the Cosmatesque patterns of marble floors of Roman churches were inlaid during the paper making process. Cosmatesque takes it name from the Roman family Cosmati who made the inlaid marble floors in many of Rome’s churches using salvaged columns from the ruins of ancient Roman buildings. 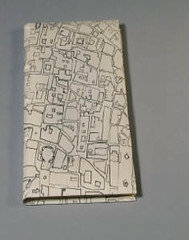 The ink drawings on the maps are of the historic center of Rome. The blue transfer drawings are of St. Peter’s basilica, designed in the Greek cross pattern by Bramante in 1506, inspired by the Roman temple, the Pantheon. The plan for the Pantheon is relief printed from a linoleum cut. The final phase of the project to date is the production of several artists’ books in which Alice presents in various book forms several of the repeating elements from both the Nolli book and the drawing suite. 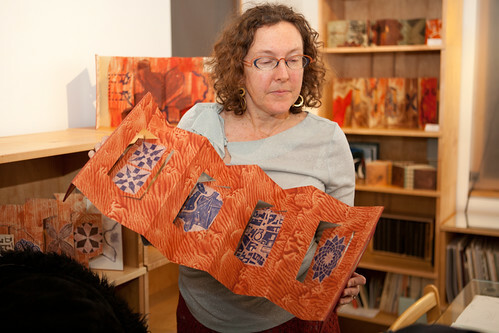 A series of three unfolding map books, folded into pamphlet bound paper cases were made using sheets of the Dieu Donne paper. The covers are of handmade flax paper from Cave Paper Mill. 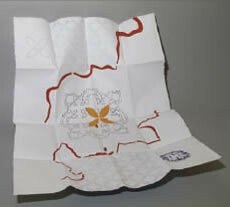 They are either printed from linoleum and sewn, printed on vellum and sewn, or pierced to create a pattern. 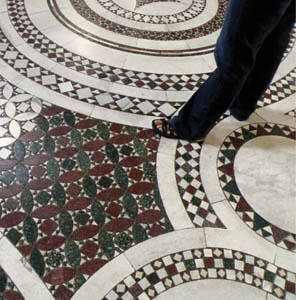 Rome is filled with patterns that have delighted Alice for years, such as an interlocking circle pattern. Alice uses this pleasing and well balanced pattern in several instances in The Rome Project, notably on the covers of the map books and on the interior pages of several of the books. The pattern seems to be a universal response to geometric repetitions. It exists all over the world, in Egyptian cloth from 2000 b.c., as well as in the mosaic designs in Rome. Also on view, are Austin’s Rome Panorama books, a series of five accordion books with cut floating panels printed and painted on Rives BFK. 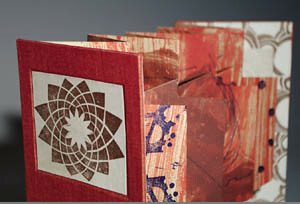 The cover of each is inset with a linoleum print on vellum, or paper. These are individually available ($500 each). 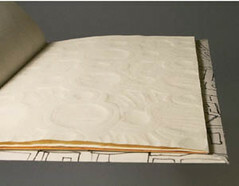 Alice has also graciously lent two of her sketchbooks, bound in traditional limp vellum style, for the exhibition. 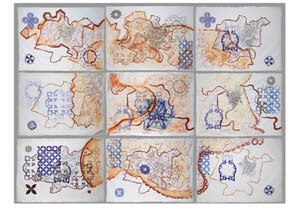 These sketchbooks provide a detailed history of the project generally and her work methods more specifically. It is an honor and a delight to be hosting this first presentation of The Rome Project at Abecedarian Gallery.